Get All The Support And Guidance You Need To Be A Success At Understanding Desktop Virtualization ! This Book Is One Of The Most Valuable Resources In The World When It Comes To How It Transforms Your Business! Is the fact that you would like to understand desktop virtualization but just don't know how making your life difficult... maybe even miserable? First, you are NOT alone! It may seem like it sometimes, but not knowing how to get started with desktop virtualization is far more common than youd think. Understanding that desktop virtualization is a concept in which the desktop environment is created to simulate the elements of an actual physical machine which will help the user see its benefits clearly. The simplicity of the desktop virtualization stems from the utilizing of a central remote server and can be accessed to provide the means for using the applications needed for data and programs via any computing base devise. Ideally the role should be able to reflect mobility as this is supposed to define the fundamentals of the desktop virtualization in a nut. However being able to combine applications, desktops and data on one device while doing this in a wireless fashion and with mobile device management can be an uphill task, if not somewhat impossible. So today -- in the next FEW MINUTES, in fact -- were going to help you GET ON TRACK, and learn how you can quickly and easily get your understanding of desktop virtualization under control... for GOOD! "This Book Below Will Show You Exactly What What You Need To Do To Finally Be A Success With Desktop Virtualization!" As a person just like you who has struggled with understanding sesktop virtualization, I have searched high and low to find the best strategies to fix this problem and I am fully qualified and equipped to help you put an end to your frustration with trying to wade through all the info you need to know to be a success! Desktop virtualization is definitely a building block system when it comes to the reference made to its mobility. With the current influx of devices from Smartphone to tablets, there is a demand to be able to have applications that provide simultaneous uploading of information at any given time. With the virtual desktop directly able to address these concerns and ensure the applications, desktops and data are all accessible with one device, the idea is catching on quickly and successfully. 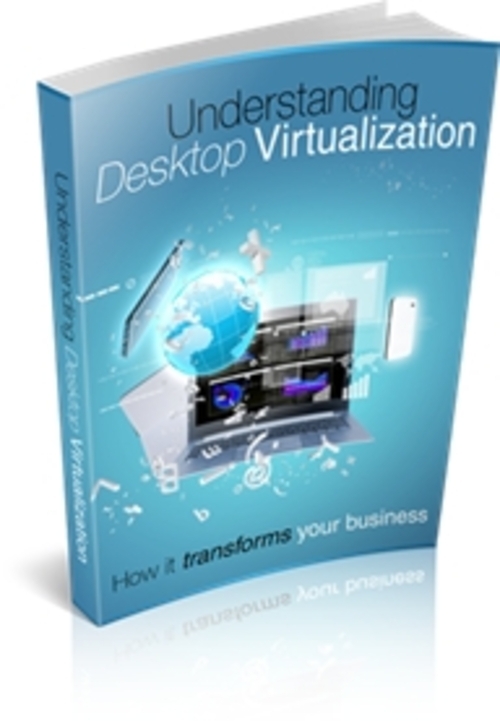 This powerful tool will provide you with everything you need to know to be a success and achieve your goal of understanding desktop virtualization to a successful place. With this product, and its great information on desktop virtualization it will walk you, step by step, through the exact process we developed to help people get all the info they need to be a success.